NOW that it has been shown that astral vibrations from the planets have such an important and far-reaching influence upon all life, the next step is to indicate more precisely how these vibrations affect humanity. Yet the reader should not be given the impression that the destiny of the soul commences at its birth into human life, and that planetary influences operating at this birth are determined by chance. Therefore, it seems advisable first to outline the old Hermetic teachings in regard to the soul. 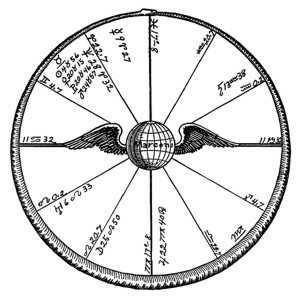 If the old Hermetic Law of Correspondences holds true—“As it is below, so it is above; as on the earth, so in the sky”—then not only the astral world, but the spiritual world, the angelic world, and the celestial world, are subject to the same sevenfold division as the physical world. In other words, the things and entities of these worlds are, even as the things and entities of earth, subject to planetary rulership. Of course, in the higher worlds the vibrations are transmitted by finer substances than the astral, but nevertheless, the entities of these realms belong to definite planetary families. All those things on any plane that are ruled by a certain planet —transmit that planet’s influence more freely than any other—are said to belong to its planetary family. Souls are no exception to this, and at the moment of differentiation in the higher realms each belongs to a certain planetary family. I may not here speak of the angelic parenthood of souls or of the circumstances surrounding their first existence as differentiated entities. These things are explained in Course II, Astrological Signatures. I may here mention, however, that at its first existence as a soul it is endowed with a definite polarity, or quality. After its differentiation the life impulse —that impulse which we observe causing all forms of life to struggle to live—carries the soul down through fleeting forms in the lower spiritual world, down through other fleeting and elemental forms in the astral world, and finally enables it to incarnate in the mineral realm of a planet. Do not think that the rocks and metals are devoid of life. Professor Chunder Bose, through extensive experiments, has demonstrated that metals, for instance, are sensitive, may be put to sleep, may be intoxicated, or may be killed. The difference between their sensitiveness and that of higher forms of life is one of degree, due to less complex organization. The idea that I wish to convey here, however, is not merely that rocks and grass and trees as well as animals are endowed with souls, but that the soul evolves through these different forms. In its descent to incarnate in the mineral, and in its ascent through innumerable lower forms of physical life, the soul has experiences of different kinds. The awareness and emotions accompanying these experiences build thought elements into the high-velocity, or stellar, body. Through other experiences these thought elements become organized as stellar cells, and these in turn into dynamic stellar structures. Thoughts, in the sense I here use the term, embrace every form of consciousness and include the sensations felt by even the lowest forms of life. All life forms react to environment through an awareness which builds mental elements into their finer forms. 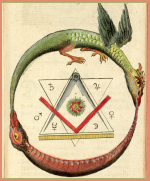 And a birth chart—even the birth chart of a primitive creature—is a map of the character, that is, of the thought organizations of the finer form, as these have been constructed up to the moment of physical birth. Living physical matter is composed of protoplasm, which is a combination of chemical elements. And the inner-plane, astral or stellar body of every living creature is composed of psychoplasm, formed of thought elements in various kinds of combinations. The physical body is built of cells of protoplasm and their secretions; and the astral body, wherein resides the soul, or character, or unconscious mind, as it is variously called, is built of thought cells, or stellar cells, as they are also termed. These stellar cells are not all alike; but are composed of thought elements of various kinds and in different proportions. They, in turn, enter into the formation of stellar structures, just as the physical cells are organized into the bony structure, the muscular structure, the nervous structure, etc., of the physical body. Due to its original Polarity, the soul, through the Law of Affinity—the Law that Like attracts Like—builds a form of similar polarity. Its experiences in this form add thought elements and thought cells to its astral body. Therefore, as a result of living for a time in this form it possesses qualities that it did not have before. And these qualities, after it has passed through a period of assimilation on the astral plane, cause it to be attracted to, and enable it to mold and function in, an organism of more complex structure. The soul, then, after it starts on its pilgrimage to matter and back to spirit again, at every step of its journey is governed by the Law of Affinity. That is, the kind of an external form it is attracted to on the physical plane depends upon the thought organization (thought signifying any type of consciousness) of its astral form. The thought organization of its astral form depends upon the various experiences it has previously had, each adding thought elements and aiding to organize definite thought cells and thought structures in the astral form. And these thought cells and thought structures, which in reality are stored up experiences gained in other forms, give it the ability to handle the life processes, and thus build about it the new and more complex body to which it is now attracted. The soul accomplishes its evolution, therefore, by being attracted to one form, dwelling for a time in it and undergoing certain experiences, then repelling this form and passing to the astral world. We speak of this repelling of the physical form and passing to the astral plane as death. Then on the astral plane there is a period of existence during which other experiences are added, and the physical experiences are assimilated and still further organized. These assimilated experiences—derived from both the physical world and the astral world—persisting as stellar cells and stellar structures in the astral body, give it the ability when cyclic law again attracts it to earth to attach itself to the forming crystal, the spore, the divided cell, or the fertilized seed that forms the physical conditions for the growth of a new physical entity. These experiences in directing the life processes that molded some simpler form in the past, also give it the unconscious, or astral, intelligence which enables it to organize about itself, or grow, the more complex life form which it now animates. I speak of intelligence advisedly. We are all too apt to take for granted the myriad wonders performed by the plants and insects and animals about us. To be sure, the intelligence they display is not on a level with that exercised by humanity. Yet from the same soil and air one plant will subtract, as in the case of the common red clover, the material to build a head of long-tubed flowers, painting them rose and purple as flaming advertisements to the bumble bees upon which the fertilization and consequent life of the species depends; while another plant subtracts the material, as in the case of the common white sage, for a shrub whose foliage is mostly white, instead of green and whose flowers are white with very short tubes, easily accessible to the honey bees, and so exposed as to attract them, and thus use them as carriers of the fertilizing pollen. Plants also are far more sensitive than is usually supposed. They possess energy very similar to the nerve currents of higher animal life. The difference between the sense of feelings in plants and that in animals is one of degree. This has been adequately and scientifically demonstrated by Professor Chunder Bose. Economic problems that still perplex humanity, such as the division of labor, have been solved by the ants and the bees. The orb weaver spider thoroughly tests his base line, then produces radial lines that are as accurately spaced as if drawn by a human architect. The oriole builds a hanging basket nest that any basketmaker might envy, and the wasps here in California anticipate cold storage. They sting spiders in such a manner as to paralyze them without producing death, and with them they fill the nests in which they lay their eggs, that the young may have fresh meat to eat during the larval stage. A thousand other instances of the intelligence of plants and animals might be cited. We may call it instinct if we wish, but this instinct is the expression of an intelligent adaptation of a means to an end. Neither does this instinct spring into existence spontaneously. It is the result of experiences which are added to the thought cells of the astral body. The organization of its astral form is responsible for the soul being attracted to the species of life which it is to animate. The physical sperm and germ, or cell life, that are the commencement of the new physical form, also have an astral counterpart. And through the thought cells associated with the genes—those portions of the reproductive cell handed down from generation to generation—race characteristics add their experiences, or mental elements, to the astral body of the entity that uses these cells as a physical basis of life. Thus certain race experiences are communicated to the astral body of each entity incarnating in the species. The entity cannot incarnate in the species, however, until it has had such experiences in lower forms of life as will give it the unconscious, or astral, intelligence to build up the new physical form it is to occupy. Even the food of the higher forms of life has had enough experience in cell building that it more readily and intelligently performs that function again. Bacteria are the lowest forms of life above the minerals, and certain bacteria can draw their sustenance directly from inorganic minerals. Plant life does this with greater difficulty, and the nitrates generated by bacteria, and the humus—decomposed organic life—in the soil are a great aid to thrifty growth. This is because the astral counterparts of such organic products have already had some experience with life processes, and therefore the more readily perform these functions. For this reason it is impractical for chemists to make food. The chemist can make bread that contains just the correct amount of each chemical element. But if this bread is to sustain life, in some manner these elements must be given the intelligence usually acquired through the experience of growth. They must be forced at once from the kindergarten, as it were, to high school intelligence. Each cell is an entity, and possesses an intelligence of its own. It may thus be said to be the expression of the soul. It has recently been estimated that there are about as many cells in the human body as there are suns in our galaxy—possibly 40,000,000,000. However, to bring our comparison nearer home, let us say there are 180,000,000 people in the United States. Now each person in the United States has a soul, and lives his own life. The United States forms the opportunity for him to live and evolve such qualities as he can. Likewise the physical body of man affords the opportunity for its numerous population of cell life to undergo evolution. The President of the United States governs the inhabitants of the United States in much the same manner that the soul of man governs the cell life comprising his body. And as the mind of the President is not the aggregate of the 180,000,000 minds he governs, neither is the soul of man the aggregate of the minds of the cells comprising his body. And were the comparison drawn still closer, the soul of man would be likened to an imperial ruler to whom the subject cells should give unquestioning obedience. The reproductive cells which unite to furnish the physical conditions by which a human soul may build about itself a physical body, each may be said to have a soul. But the souls, or intelligences stored in the astral forms of these reproductive cells are, like other cell life, undergoing their own evolution, and they do not become the soul of the child. The soul of the incarnating child has its own astral form, in which are stored as organizations of stellar cells, all the experiences of its past. The union of the sperm and germ furnish the conditions for it to become attached to the physical cells, and through cell division to build up about it a human form. The heredity genes in these reproductive cells form the physical link by which race and family characteristics, stored up in the stellar cells of their astral counterparts, are transmitted to the astral body of the child. These race and family characteristics are experiences which are handed on from generation to generation, even as human traditions are passed from one to another by word of mouth. They are thus acquired by the incarnating soul through mental experience. They are experiences derived through the astral rather than through the physical. But as we shall later discern, experiences coming from the astral plane are quite as effective as those coming from the physical. The soul that incarnates in human form has evolved up through innumerable lower forms of life, at each step gaining new experiences that enable it to be attracted to, and more or less successfully build about itself, a higher form. It now, along with other souls, exists on the astral plane. Whenever there is a ripened ovule in the female organism, one of the conditions is fulfilled for attracting a soul from the astral plane. The intense emotions of the sexual union raise the parents’ vibrations to a state where they unconsciously are closely in touch with the astral plane. They actually attract entities from the astral plane to them at this time that correspond to the plane of their desires and emotions and the harmony or discord between them. They contact energies at this time that they do not at any other, which makes it exceedingly important that the motives be lofty and pure. This astral plane, inhabited as it is by innumerable entities and forms of life, is not away off somewhere in space. It is all about us, and it requires but the proper conditions to be contacted at any time. Observation indicates, however, that astral substance does not communicate motion directly to physical substance. The difference in velocity between the two planes seems to be too great for such direct transmission. But electromagnetism, whose velocity seems to lie between them, performs the function of transmitting energy from the physical to the astral, and from the astral to the physical. To be able to affect physical substance, an astral entity must utilize electromagnetic energy that already is associated with physical substance. Certain persons emanate electromagnetic energy in large volume, and in such a form that it can be used to transmit astral motions to atomic matter. Astral entities then use this electromagnetic energy for the production of supernormal physical phenomena. And the person furnishing the excess of electromagnetic energy is called a Medium. It is this electromagnetic energy that constitutes the vital principle of all physical life. When associated with minerals it is called Mineral Magnetism. As the vital element in vegetable life, binding together the thought cells and the physical cells and furnishing the motive power for the various vegetative functions, it is known as Vegetable Magnetism. In the animal kingdom it binds together the astral and the physical body, constitutes the vital energy, and is known as Animal Magnetism. In man it performs a like function, and is known as Personal Magnetism. Its quality depends upon the organization of the physical life it vitalizes. It persists only so long as the astral counterpart and the physical are held together, forming the means by which energy is conveyed from one to the other. At the death of the organism this electromagnetic counterpart, or electromagnetic organization, quickly dissipates as the physical particles disintegrate. Now, nerve currents are electric energies. And when the intense vibrations of sexual union create an electromagnetic vortex, this also creates a vortex in astral substance, and the field of force so created, if there is a ripened ovule in the female organism, attracts the soul of a child of corresponding vibration. That is, the souls on the astral plane, that have evolved through the various lower forms of life to a point where they are now ready for human incarnation, vary as greatly in quality as do the people of the world which they become. This variance is due to their having had a different polarity at differentiation, which in the course of evolution attracted them to widely different experiences, and these divergent experiences organized different thought cells in their astral bodies. From the cosmic standpoint such variety seems necessary, for if all had the same experiences, all would become fitted for the same task in cosmic construction, and it seems that cosmic needs are such as to require souls whose educations bring out a wide variety of talents. But however that may be, the astral bodies of different souls have been differently organized through experiences, and the vibrations of the parents at the time of union attracts a soul whose astral body corresponds in vibratory rate to the vibrations set in motion by the parents. Even should there be no physical union of the parents—for the astral plane is ever ready to utilize whatever conditions permit the physical incarnation of the life forms which crowd it—if conception takes place, it is the vibratory rates of the parents, imparted to the sperm and germ, that determine the type of soul which is able to become attached to the fertilized cell. If the general plane of the parents’ thoughts are low, and particularly if they are on a low plane during union, the soul attracted will be of corresponding low moral bias. If their love vibrations are exalted, and the general level of their thoughts and aspirations are high, a soul of high spiritual qualities will be attracted. The mental abilities of the soul attracted, as distinct from the moral, depend more upon the intensity of the union. And the physical strength and vitality depend more upon the harmony between the parents. The soul thus attracted is magnetically attached at the climax of the union to the physical ovule through the electromagnetic field then formed. The positive electric energies which are the foundation of the future child’s vitality are furnished by the father. They are strong or weak as he is or is not virile and intense at the time of union. The receptive magnetic energies which are the foundation of the future child’s constitution and general health are furnished by the mother. They are strong or weak as she is, or is not, virile and intense at the time of union. Upon the harmony between the parents, and the balance in intensity, depend the physical balance and in a measure the general success and happiness of the future child. That is, any discord or lack of balance between the parents in general, and especially at the time of union, will attract a soul in whose astral form are similar qualities. And these discordant thought cells in its astral body will during life attract inharmony in environment and inharmonious events. Did parents but more fully understand the importance of complete harmony between them, certain souls now born in human form would be compelled to evolve higher upon the astral plane before incarnating, and there would be fewer children born with improper equipment for life. When conception takes place the astral form of the soul becomes permanently attached to the united sperm and germ. The electromagnetic energy furnished by the father becomes the vital force, and that furnished by the mother becomes the magnetic force, and together they form the electromagnetic form. Through the medium of this electromagnetic energy the astral form attracts the physical particles in the process of growth in such a manner as nearly as possible to build a physical counterpart of the astral form. The astral form is the mold which the physical particles strive to fill in detail, even as hot metal will take the form of the mold into which it is poured. In so far as the physical materials at hand will permit, the physical body grows into an exact likeness of the astral body. The child, during the period of gestation, has entered an environment largely influenced by the thoughts and feelings of the mother. Both the physical and the astral bodies of mother and child are closely associated. There is a constant exchange of energies between them. As a consequence, mothers frequently notice that their natures and dispositions change markedly during pregnancy. This is due to the astral vibrations of the child communicating themselves to the mother. If there is a marked discord between the astral makeup of the mother and the child, she will suffer from this discord. In this case the discord may not belong either to the mother or to the child except that their association, due to difference in vibratory rates in their astral bodies, sets up discord. But of far more importance than the temporary influence of the child upon the disposition of the mother is the mother’s influence upon the unborn child. The child’s astral form at this stage is unusually plastic and receptive to vibrations. Thus it is that cases are known in which the mother kept the image of a loved one in her mind during gestation, and the child when born resembled in features this loved one rather than the father or the mother. A sudden strong desire during pregnancy, or a sudden fright, sometimes results in a birthmark more or less resembling the object causing it. Such fright, when extreme, has been known to deform the offspring. In this intimate relation between mother and child during pregnancy the mother has a wonderful power for good. Her thoughts, her emotions, and her desires are the environment in which the child is living. They communicate rates of motion to its astral form, modifying the thought organizations already there. Upon the thought organization of the astral form, thus modified by the mother’s influence, depends the character of the child when born and the events of its life. It is not necessary here to enter into a discussion of the Prenatal Epoch, as the theory of the relation between the time of conception and the time of birth is called, for this is treated in Chapter 8, Course X-I, Progressing the Horoscope, Serial Lesson 117. Nevertheless, it should be pointed out that gestation is under astrological law, and that the child will not be born and live until the astral vibrations at that place set up by planetary positions correspond in pitch, tone, harmony and discord with the astral vibrations of the child then born. It is not to be supposed that this vibratory correspondence is so strict as to allow no latitude. For instance, in tone, the vibrations between certain limits all are said to produce middle C. The color red, likewise, is not a set number of vibrations per second, but those vibrations within a certain range. In the case of birth, however, if the difference between the vibrations of the astral body and those of the planetary influences at the time of birth are extensive, the child suffers, and if too great it will die under the first discordant Progressed Aspect. Hence it is that instrumental deliveries and artificial births may cause an entity to function through a form incapable of responding to its internal nature. Yet there are other times than at the end of the nine-month period, notably at seven months from conception, when the vibrations set up by the planets correspond closely enough with the astral form of the child for it to be born and live to a ripe old age. While there is a certain range of vibratory rates within which the similarity between those of the character and those in the sky is close enough that the child then born will live, nevertheless this similarity—as careful analysis of tens of thousands of birth charts by our Research Department proves—is always close enough that the outstanding factors of character are accurately mapped in the birth chart. And as not only the abilities, but every event of life, is an expression of, or is attracted by, those thought organizations which comprise the character, the birth chart gives a clear picture of the life if nothing special is done to change the character. That is, as all that happens is the result of character, the only manner in which the destiny can be changed is to change the character. Furthermore, as destiny is the outcome of character, and through intelligently directed effort the character can be changed, the life indicated by the chart of birth—which is merely a map of the character with which the individual is born—can be markedly altered in any direction desired. 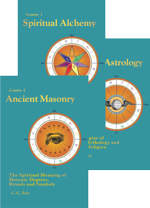 As indicated in Chapter 3 (Serial Lesson 41), scientific astrology need concern itself with but four sets of factors: 1. The 12 zodiacal signs and their 36 decanate subdivisions. 2. The 10 planets. 3. The 12 mundane houses. 4. The 10 aspects. In that chapter it was indicated what each of these four sets of factors represents as an influence from without. Now, therefore, let us consider, that we may the better understand how the character and thus the fortune can be altered in any direction desired, what each of these factors maps in the astral body. Aries always maps the region of the head, Taurus the region of the neck and ears, Gemini the hands and arms, etc. They also map the series to which the thought cells in the compartments of the astral body coincident with these zones belong. Thus the thought cells in the Aries zone belong to the I Am series, those in the Taurus zone to the I Have series, those in the Gemini zone to the I Think series, etc. The astral, or inner-plane body, is divided not merely into zones as is the physical body—head, neck, arms and hands, heart and back, etc.—but is also separated into 12 different compartments. And these compartments of the astral body are not located in reference to the zones of the astral body the same in different persons. That is, compartment one may largely lie in the Aries zone, the Gemini zone, or some of the other zones, according to the character of the individual. This relationship is indicated by the manner in which the signs are arranged in relation to the houses in the particular birth chart. Yet whatever zone covers it, experiences relating to health and the personality build their thought elements into the 1st compartment; experiences relating to personal property build their thought elements into the 2nd compartment; experiences relating to short journeys and brethren build their elements into the 3rd compartment; experiences relating to the home build their thought elements into the 4th compartment; experiences relating to love affairs, entertainment and children build their thought elements into the 5th compartment—and so on in such a manner that every department of life builds by its experiences, thought cells in one of the 12 compartments of the astral body. In a birth chart the houses accurately map these 12 compartments of the astral body. Each house of the birth chart, therefore, maps the thought cells relating to one department of the life. As what comes into the life, and whether it comes fortunately or as a misfortune, is determined wholly by the amount of activity and the harmony or discord of the thought cells in the astral body relating to that department of life, the houses of a birth chart accurately map what may be expected if nothing special is done about it, from each department of the life. That is, what happens is due to the activity of the thought cells working from the high-velocity plane; and if we know how they are organized and energized we can discern the events they will attract to the individual in whose finer form they make their abode. The thought cells of a particular type which have had added to them experiences of greatest intensity, and through repetition of similar experiences the greatest volume of energy, become organized through these intense and closely related experiences into a stellar structure of a highly active nature. We call such an energetic group of thought cells in the astral body a Dynamic Stellar Structure. And in the birth chart it is always mapped by the planet ruling the thought element which is most active in it. 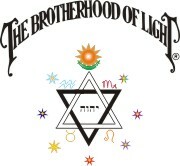 To put it another way, those experiences which are most intense and belong to a given planetary family build a highly dynamic organization of thought cells in some particular region of the astral body; and this energetic organization of stellar cells is always mapped in the birth chart by the planet most closely related to the experiences which are responsible for its construction. Such a dynamic stellar structure acts as a receiving set for transmitting to the thought cells of the astral body the vibrations of the planet mapping it in the birth chart. Experiences, however, are not isolated events, but through the Law of Association (see Course V, Esoteric Psychology) are related to other experiences. Events that affect one department of life also frequently affect other departments. Furthermore, experiences are pleasant or painful, that is, harmonious or discordant; and it is the amount of harmony built into the thought cells thus formed that determines the fortune they will attract to the individual; and it is the amount of discord built into the thought cells so formed that determines the misfortune they will attract to the individual. In other words, if they feel happy, they work from their high-velocity plane to attract good fortune; but if they feel mean, they work with equal diligence to attract misfortune. These relations between types of experiences of sufficient energy to form dynamic stellar structures, build lines across the astral body from one dynamic structure to other dynamic structures with which experience has thus associated them. Such a line forms a ready avenue by which the compartment of the astral body at one end is able to transmit energy to the compartment of the astral body at the other end. That is, departments of life so associated continue throughout life, if nothing special is done about it, to have an influence of a particular kind over each other. Such a line, by its length, also indicates whether the two compartments are associated harmoniously or inharmoniously, and thus whether the thought elements mapped by the planet at either end have entered into a harmonious or discordant thought-cell compound. But in addition to this, each such line acts as a stellar aerial to pick up, radio fashion, the energies of similar quality radiated from the planets. That is, if it is of a length suitable only to picking up discord, it will pick up the energies of the planets mapped at each end only so loaded with static that this energy disturbs the thought cells in a very disagreeable manner. But if it is of such length as to pick up the energies mapped at each end harmoniously, it delivers these planetary energies to the thought cells at either end in such pleasing quality as to cause them to work from their high-velocity plane to attract fortunate conditions into the life. These lines across the astral body, which, unless something special is done to change them, all through life pick up, radio fashion, planetary energy, thought energy, and character energy radiated from objects, in a particular manner, are called PERMANENT STELLAR AERIALS. They are mapped in the birth chart by the ASPECTS. Environment constantly stimulates changes in all life forms; and chief among these environmental forces are the invisible radiations from the planets. As the planets move forward after birth through the signs of the zodiac the energies fall upon the zone of the astral body governed by the sign they are passing through. And it seems that the astral body of a child is more plastic and receptive to these astral vibrations during the early days and months of its life than when older. Furthermore, the energies then received do not spend their force at once, but are liberated through cycles. In the same way that we determine the cycles governing the different stages of development of the embryo in a duck egg, and can thus make definite predictions from this knowledge, or as we can predict that a certain strain of corn when planted will be out of the ground in so many days, in so many weeks will tassel, in so many months will be in the milk, and that one hundred days from the time placed in the ground will mature; we can also determine the cycles governing similar releases of energy stored in the human astral body. That method is through observation. Observation acquaints us with the fact that there are three distinct releases of energy, each measured by its own cycle. The most important such release is at the ratio of the movements of the planets during one day after birth releasing energy then stored during one year of life. The next most important such release of energy is at the ratio of the movements of the planets during one month after birth releasing energy then stored during one year of life. And the least important such release of energy is at the ratio of the movements of the planets during one day after birth releasing energy then stored during the same day of life. Because the mapping of these three methods of energy storage and release is done by moving, or “progressing” the planets through the degrees and signs of the birth chart, the releases of energy after this manner are called Progressions. They are comparable to the releases of energy of a clock which has an hour hand, a minute hand, and a second hand. Energy is stored up in the clock by being imparted to a spring, or by weights being lifted. The energy stored up in the clock weights is not released all at once—no more so than the energy stored up by planetary movements immediately following birth. 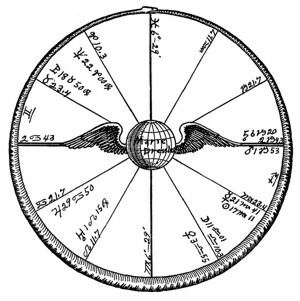 In the case of the clock it is released by the cyclic movement of the pendulum or other device; and in the case of the birth chart it is released by the cyclic motion of our earth about the Sun. The Hour hand of the clock corresponds to the important day for a year ratio of release in the astral body, which is the ratio of Major Progressions. The Minute hand of the clock corresponds to the next most important month for a year ratio of release in the astral body, which is the ratio of Minor Progressions. 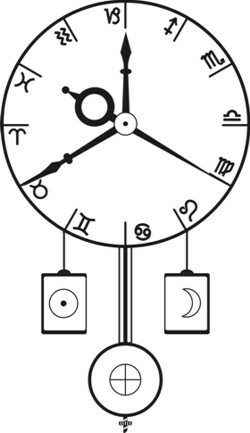 The Second hand of the clock corresponds to the least important day for a day ratio of release in the astral body, which is the ratio of Transits. As the planets thus move forward after birth, regardless of aspect, or aerial, they store up energy which when released according to the ratios of progression, imparts their type of energy to the zone where they are shown by progression; and this gives the thought cells of the indicated region more than their normal activity. And this is true whether the planet moves through the sign by Major Progression, by Minor Progression or by Transit; although the amount of energy thus imparted and released by Major Progression is far greater. From what has now been said I think it will be clear that the function of Progressions is to map those structural changes which take place in the astral body, in obedience to cyclic law, that permit energies from the planets at definite and predictable times, to reach certain groups of thought cells in volume enough to give them extraordinary activities. When a planet progressing according to one of the three indicated ratios forms an aspect with a planet in the birth chart, or with another major progressed planet, the energy release then builds across the astral body a line which acts as an aerial which picks up and transmits to its two terminals, energy of the type of the two planets involved in the aspect. Experience proves that these temporary stellar aerials, mapped by progressed aspects, while their influence may be felt over a somewhat longer period, are seldom clear cut enough to pick up sufficient energy to bring an event into the life either before or after the planets are within one degree of the perfect aspect. These temporary stellar aerials thus formed by the cyclic release of energy, have a length indicated by the aspect which maps them, and this determines whether the astral energy, from any source derived—thought energy, and character-vibration energy as well as planetary energy—which they pick up, will be given a harmonious turn, or will be loaded with discordant static. To the extent they transmit energy which is harmonious to the stellar cells at their terminals, are the thought cells there given an impetus to work to attract favorable events. Likewise, to the extent these temporary stellar aerials transmit energy which is discordant to the stellar cells at their terminals, are the thought groups there located given an impetus to attract misfortune. The stellar cells of which the astral body is composed, the more active of which are organized into dynamic stellar structures which are mapped by the planets in the birth chart, have a certain intelligence of their own, and work from the high-velocity plane to attract into the life conditions and events corresponding to the way they feel. When they receive no additional energy from any source they have only the amount and kind of activity indicated by the birth chart. It is only when, from some source—astrological vibrations, thought vibrations, or the character vibrations of objects—they receive an additional energy supply that their activity is greater than the normal thus shown. 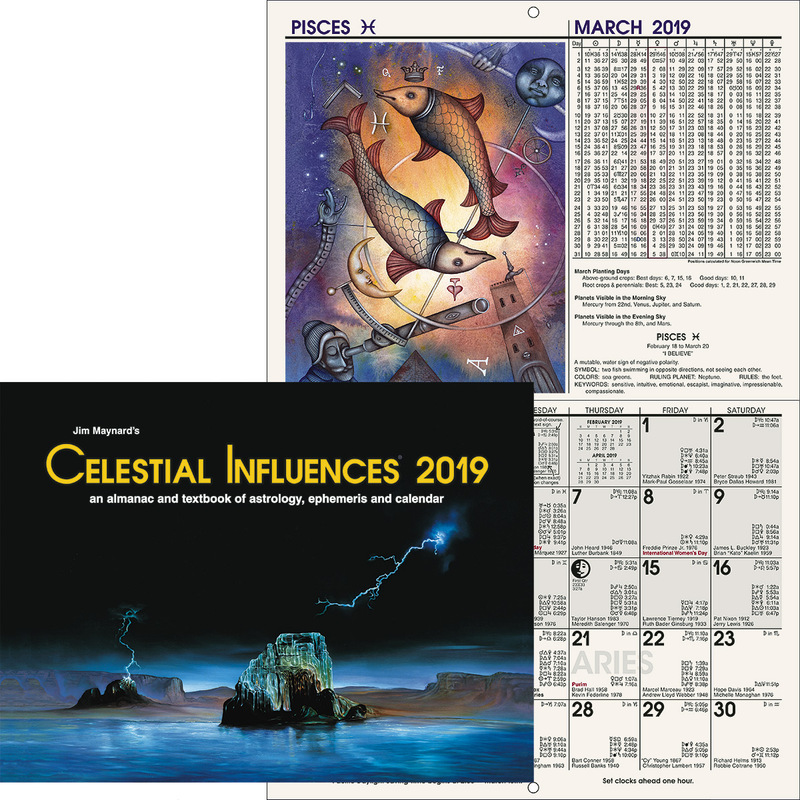 The whole problem of predicting the nature and time of events by natal astrology, therefore is to ascertain the time when certain groups of stellar cells within the astral body will receive additional energy; and in what volume and in what harmony or discord it will reach them. And it is this that a knowledge of Progressed Aspects enables us to do. Because, except some special effort based on astrological knowledge is made, the stellar cells of the astral body receive additional energy of sufficient intensity only when Progressed Aspects indicate Temporary Stellar Aerials have been formed across the astral body; events apart from the normal everyday trend of life are attracted only when Progressed Aspects are present within one degree of perfect. And as the temporary stellar aerial thus mapped is plainly associated with certain compartments of the astral body, as mapped by the houses of the birth chart influenced by the aspect, the department of life to which the thought cells belong which are thus given additional activity is readily apparent. The families to which the thought cells belong, and therefore their type of activity—aggressive, social, timid and cunning, etc—are indicated by the planets involved in the Progressed Aspect. The department of life to which they will give increased activity is shown by the house rulership of the planets involved in the Progressed Aspect. And—taking also into consideration the normal harmony or discord of the thought cells thus given activity—the nature of a Progressed Aspect determines whether, and to what extent, the unusual activity of the thought cells thus given energy will be favorable or unfavorable in the type of events they attract. While it is true that the structure of the astral body responds to cyclic law and tends to build lines, or temporary stellar aerials across the astral body, at the time energy is released through Progressed Aspects; it is also true that the astral body, unconscious mind, or character, as it is variously called, is equally responsive to properly directed thoughts and emotions. Anything that can be done in the way of structural changes and adding energy to thought cells by planets, can be done equally well through persistently directed thoughts and cultivated experiences. The thought cells were built into the astral body in the first place through states of consciousness stimulated by environment. They were not built there by the environment, but by the mental reaction to it. And by cultivating a proper reaction to planetary vibrations at the time of the release of energy by Progressed Aspects the events usually to be expected can be markedly changed in the direction desired. 2. He should be told, in connection with each department of life, what will be attracted, and why, if nothing special is done about it. 3. He should be informed as to the best methods to follow to change the destiny of each department of life in the desired direction. 4. He should be told what a progressed aspect represents. 5. He should be told what events each progressed aspect during the period covered may be expected to attract if nothing special is done about it. 6. In connection with each progressed aspect during the period covered he should be told the very best method of causing the energies then present to attract, not what they otherwise would, but what he desires. 7. To show that the basis for such information is at hand he should be given an accurately erected chart of the time of day of birth. Pluto, planet of radio, conjunction Venus and Mars, square Saturn, square Moon in house of messages (3rd), trine Jupiter. Uranus, planet of invention, opposition Saturn, square Sun, trine Mercury, planet of communication, in house of honor (10th). 1896 patented first wireless telegraph apparatus: Sun square Moon r, in house of messages (3rd); Sun P. Uranus, planet of invention; Mars sextile Mercury r, planet of communication, in house of honor (10th). Became famous as a screen actress after 55 years of age: Venus in its home sign in house of late life (4th), conjunction Moon in house of entertainment (5th), sextile Uranus in house of money (2nd). At about 55, under Sun conjunction Saturn r, following Sun square Moon r and Mercury square Moon r, without funds, ready to give up, and no hope of a career. Under Venus sextile Jupiter p, went to an astrologer who gave her hope; told her fame and fortune ahead. Died June 28, 1934, of cancer; Sun square Neptune p, Sun semi-square Saturn r.